Yesterday I posted a chart from a group called Medical Billing and Coding Certification that featured an astonishing statistic: in the U.S., one out of seven hospital-acquired infections (HAIs) leads to death. That’s 14%. In Europe the number is only 1 out 122, or a mere 0.8%. I guess it was too good to check, so I didn’t check it. But a reader emailed this morning to suggest that this was preposterous, and he seems to be right. I checked the references at the bottom of the MBCC chart, and none of them seemed to back up their numbers. What’s more, a few years ago the CDC estimated 99,000 deaths per year out of 1.7 million HAIs, a mortality rate of 5.8%. For the EU, the European Centre for Disease Prevention and Control estimates 146,000 deaths per year out of 4.5 million HAIs (see p. 27), a mortality rate of 3.3%. That’s a modest difference, and it gets even more modest when you read more about these estimates, which are very, very rough and depend strongly on exactly how you count infections and how you attribute deaths. You can read much more about it in this WHO report if you’re interested. 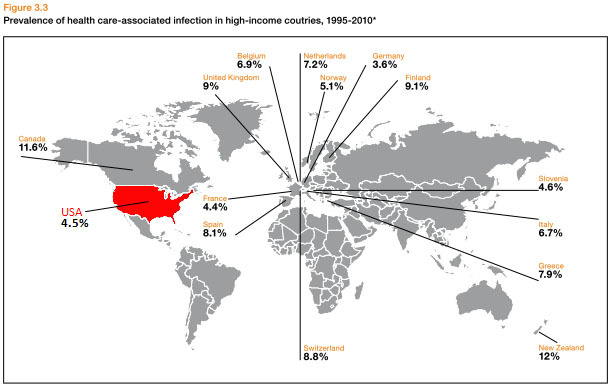 The chart below, from the WHO report (with U.S. figures added from here), shows HAI prevalence rates in various high-income countries, and on this score the U.S. does pretty well. Most likely, the U.S. is about average both in prevalence of HAI and in mortality rates from HAI. Apologies for the error.